Confront and overcome common probability misconceptions. Count equally likely outcomes using diagrams. Discuss relationships between theoretical probabilities, observed outcomes, and sample sizes. Calculate probabilities of independent events. Before the lesson, students work individually on a task designed to reveal their current level of understanding. You review their scripts and write questions to help them to improve their work. In the lesson, students are asked to work collaboratively on some simple games. They make predictions of the outcomes and then conduct the experiments and gather data. In a follow-up lesson, students use their learning and your questions to review their initial answers and to complete a follow-up task. Each individual student will need a mini-whiteboard, a pen, an eraser, a copy of the assessment task Spinner Bingo, and the assessment task Number Game. 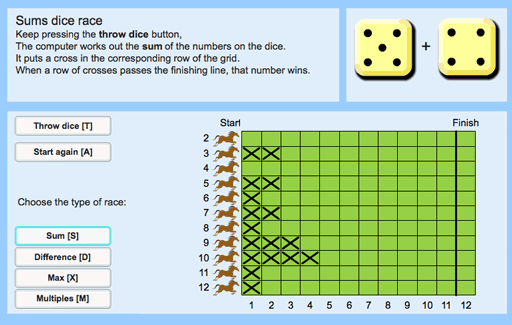 Each small group of students will need two dice, 11 counters or buttons, a copy of the task The Horse Race, a copy of the Rules of Horse Race, and the Race Results Sheet. The race board should be enlarged if possible. Each small group will also need copies of the Sample Student Reasoning sheets and the Other Horse Races sheet. If a computer is available, the software may be used as well to make it possible to play many more games. The software and projector slides will also support whole-class discussions. 20 minutes before the lesson, a 120-minute lesson (or two shorter lessons), and 10 minutes in a follow-up lesson. Exact timings will depend on the needs of your class.